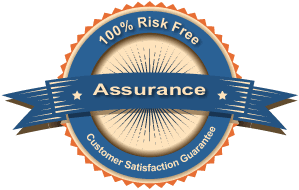 We have the best guarantee in the business! If you do not pass your actual exam, after mastering our material with our simulated exams, we will refund 100% of your money. Simply send us a copy of your failure notice within 90 days of purchase and we will issue a refund. We can only offer a pass guarantee for exams we cover, i.e. please visit our "Select Your State" section of this website to ensure we offer a preparation program for the exam(s) you are taking. *You may take the simulated exams as often as you like to get your competency meters up. The competency meters will indicate if you are poor, weak or good in each of the exam topics. These meters are very accurate in demonstrating your chances of passing the actual exam, and are a great tool to help you better manage your study time. If your competency meters are showing "good (green)" in all exam categories, we guarantee you'll pass or your money back. *Due to 2008 Florida Statutes, we can not offer a pass guarantee to those taking an exam in the State of Florida. Sorry. Purchasing over the Internet can be nerve racking. It is our #1 goal to make sure all of our customers are pleased with their purchase. We make test preparation effective, easy and risk free. Here at NightBeforeTheExam.com you get more with our Satisfaction Guarantee. We love our customers. If you are not satisfied in the first 24 hours you can get your money back. Seriously. We won't charge you extra to get our Satisfaction Guarantee. Do you need more time to study? No problem, contact us and we will just give you more time for free. Are stuck on an exam concept and need one-on-one help? Just kick us an email. We are a different exam prep company offering leading edge features at an affordable price. Made for real people just trying to study with something that is engaging and fun.